Port Moresby (Agenzia Fides) - "During this day let us reflect on the blessings we have received as a Country. We must thank God for the journey undertaken. We are proud of being a people, a nation and a country": said Fr. 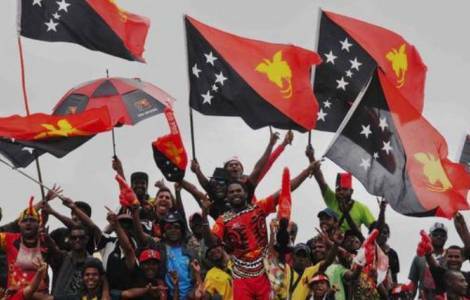 Victor Roche, SVD, Secretary General of the Episcopal Conference of Papua New Guinea and the Solomon Islands, on the occasion of the 43rd Independence Day of Papua New Guinea, which occurs on Sunday 16 September. As in previous years, the event will be colored by a variety of activities. From folk dances, to singing, to music and to art and craft initiatives. The national colors of the country will be seen everywhere. As Fides learns, Fr. Victor, expressing the vision of the Catholic episcopate, said: "For many centuries we have lived in our small communities and villages hidden from the outside world. Today, finally, thanks to our ancestors we are connected to the rest of the world community as a single nation". The Secretary thanked God for the progress made in Papua New Guinea in terms of infrastructure and human resources and also spoke of the Asia-Pacific Economic Cooperation (APEC) meeting to be held in November 2018. "We wish the Prime Minister and his government all the best - he said - in this great venture. This is an important opportunity for us to show the rest of the world that we are a mature and independent country".